Innovative and stylish is how many 2017 Hyundai Tucson reviews describe this small crossover SUV. Featuring everything from advanced tech and top-notch safety gear to sporty styling and nimble handling, the new Tucson is a cut above the rest. Learn more below! No matter the trim, SE, Eco, Sport or Limited, the 2017 Hyundai Tucson in Arlington, Texas comes well-equipped. Starting with the base SE, it gets standards like 17-inch alloys, rear privacy glass and heated mirrors that can wick away moisture in a hurry. 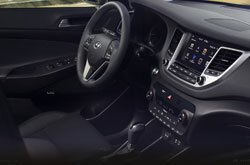 On top of these benefits, the five-passenger SUV also comes with a 5-inch touchscreen, Bluetooth, USB port, six-speaker sound system and satellite radio. Upper trims add leather upholstery, dual-zone automatic climate control, navigation and an eight-speaker audio system. You'll have a hard time finding a single 2017 Hyundai Tucson review that doesn't rave about the vehicle's three engine options. Standard on the entry-level S is a 2.0-liter four-cylinder that is rated at 164 horsepower and 151 pound-feet of torque. A six-speed automatic is standard, and the engine can be paired with either a front-wheel or all-wheel drivetrain. All other trims get a 1.6-liter four-cylinder turbo that puts out 175 horsepower and 195 pound-feet of torque. It comes mated to a seven-speed, dual-clutch automatic. For Arlington drivers who want a new SUV that comes with plenty of safety features, the 2017 Hyundai Tucson in Arlington delivers. A rearview camera, antilock brakes, stability/traction control, active front head restraints, hill-hold assist and high-quality airbags are all included. Top trims add rear parking sensors, automatic braking and pedestrian detection. 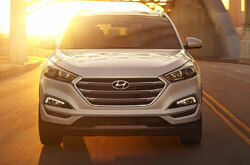 A modern SUV that provides high-end amenities at an affordable price, the Tucson makes the perfect travel companion. Come test drive one today at Vandergriff Hyundai! 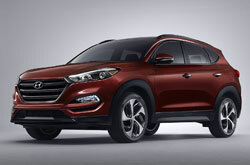 Find out why people shopping for new car models near Dallas consider the venerated 2017 Hyundai Tucson instead of the 2017 Toyota RAV4, Honda CR-V, Nissan Rogue and the Ford Escape. It could be a superb match for you, due to its excellent on-board technologies and exciting personality. See if the 2017 Hyundai Tucson is right for your everyday needs, then browse our website to find new information on great short-term lease offers. 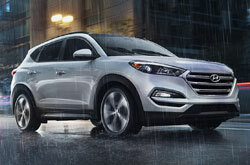 To see a superb selection of cars, come to us to find finance offers on the most recent version of the Hyundai Tucson. 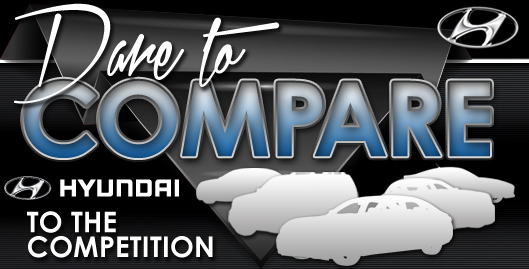 Our thorough review makes it quick and easy for you to find the specifications you need, and we hope it helps when it comes to making a stress-free vehicle purchase. We have a gigantic assortment of fantastic Hyundai Tucson models in Arlington, TX at Vandergriff Hyundai- drive one today. If you're anxious to see it prior to your visit, view its cabin and see how it's outfitted in the embedded video.